The BBC are continuing down the road of pointing the finger of blame at white, far right groups or individuals and other domestic possible candidates for the Boston bombing…..you have to ask on what evidence?….other than the coincidence of the date of the attack there is nothing else to go on. Shame the BBC haven’t displayed the same maturity as they rush to judgement for their own reasons. Now there is absolutely no evidence that these two were involved in any way…but it shows that the following claim by Frank Gardner is, er, somewhat premature and that the investigation is still open to many possible scenarios. The Telegraph has noted that a ‘witch hunt’ is in progress for the culprits…it can’t help when the BBC join in…..
‘So what lines is the Boston investigation following and why? Where’s the evidence for his claim? ‘America has long been their favoured target, but there are reasons to question whether this was the work of jihadists. As far as I am aware no such statement has been made by US officials as to the effect that this is a domestically inspired attack. As the New York Times says today they are pursuing a broad range of avenues…..
‘While investigators have focused on the images of the possible suspect, they are continuing to pursue a broad range of other avenues, one law enforcement official said. ‘Tunnel Vision’…the trouble with the BBC is that they only see one thing at the end of that tunnel…an angry white man. Such quick and easy judgements based on pure conjecture with a good dose of wishful thinking thrown in for good measure sparks off the usual witch hunts against the Right which if it happened to Muslims the BBC would be outraged about. The BBC feeds that frenzied witch hunt by making claims that have absolutely no truth to them at the time made. The bombers could well be over taxed, angry white men, or it could have been Jihadists or anyone with a grudge about something. We don’t know, even the US government probably doesn’t know yet…and the BBC certainly doesn’t know. This is an incredibly partisan, highly ideological, not to mention intensely racist tract. It suggests that white, right wing groups do not get the same attention as for example Muslim groups do. Read Der Spiegel and you will know that the Neo-Nazis are under constant observation and security attention in Germany. In the UK the EDL et al in this country are the subject of similar attention from the security services. The Far Right in no way has a ‘free pass’ to do as it likes nor a ‘get out of jail free card’. Odd the BBC not report the Saudi national being deported on security grounds…. hey bbc you were right, sure look like ole whitey breivik republican mcveigh .waco stylee… erm saudi? types to me. hmm no one has been arrested, but all Saudis have been cleared? After Kerrys closed meeting , the other day, now Barack Obama has unplanned meeting with the Saudi Foreign Minister today? this gentleman is going to be deported? …… on security reasons? someone rather swarthy in appearance. arabic people nearly always notice each other, it is the islamic way, particulary if abroad … no interest at all to CIA/FBI? The bizarre, racist, anti-white rave of David Sirota in The Salon (“Let’s hope the Boston Marathon bomber is a white American”) isn’t even accurate. He claims that “white dudes” are mainly responsible for mass shootings in the USA. Really? How about such recent shootings as: Oikos University 2/4/2012, 7 killed by One L. Goh; Su Jung Health Sauna 22/2/2012, 5 killed by Jeong Soo Paek; IHOP shooting 6/9/2011, 5 killed by Eduardo Sencion; Hartford Distributors 3/8/2010, 8 killed by Omar Shariff Thornton; Fort Hood 5/11/2009, 13 killed by Nidal Malik Hasan; Binghamton 3/4/2009, 14 killed by Jiverly Wong; Virginia Tech Massacre 16/4/2007, 32 killed by Seung-Hui Cho. And that’s by no means an exhaustive or selective list. Kermit Gosnell killed more than any of them. And young black and Hispanic men kill hundreds and wound thousands of each other every year in cities across the country. It’s wrong to use ethnicity here no matter how you slice it. In the febrile aftermath of terrorist attacks, I can see value in the authorities prioritising on the basis of what is ‘likely’. The same cannot be said of the hopes of ‘reporters’ in name only. It’s a numbers game. Out of all the guesses, one will be proven right, and this person will be deemed a sage. None of those who took a punt and missed will suffer any consequences. Leaving them free to do the same again, in hope of winning the title for a while, next time. A lot of confusion surrounding Boston investigation right now. A real reminder to exercise caution in reporting. I was going to concede these were wise words, but given they are from an in-theory professional, seasoned ‘news’ reporter, they demanded closer scrutiny by her feeling the need to utter them. Most events that are newsworthy (beyond #prasnews cut and paste jobs, and even then..) probably involve a variety of surrounding factors, of which confusion is but one. I’d be intrigued as to what circumstances the BBC’s finest feel only ‘normal’ caution will suffice in their ‘reporting’. It may come as some surprise to Ms. Kay that if almost anything is ‘reported’ these days, and especially by the BBC, this may be better viewed more as a starting point at best. Katty was speculating on air along with all the rest of them earlier this week. “ironsides” gardner strikes again eh! one imagines that if all around him, are screaming “allahu ackba” he ll be looking for the link to the BNP. how desperate do you think the bbc and the lefties will get to cover up this islamic terrorist attack in boston,here is a idea for them.say it was 2 white guys browning themselfs up as a disguise,case solved. Just being mischievous but the Boston Bombings happened on the anniversary of the birth of the Illustrious Founder of the North Korean Dynasty, Kim Il Sung but of course the current peace loving leader of NK would never contemplate any kind of attack on the Mainland United States, would he? But even if that wild idea were a reasonable possibility would the Beeb be as anxious to point the finger in that direction as they are with their wishful thinking that the culprits could only be right wing fanatics of some form? Compare & contrast the two images, the poor quality one which the bBC have chosen appears to show two Caucasian white males where the NYT clearly shows them to be of middle eastern / SW Asian origin. Is the bBC up to its politically correct tricks again? NYP pictures are confirmed to be of innocent persons. 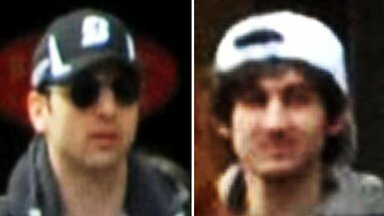 Also, Black cap guy in FBI photo is now dead, possible explosive device attached to chest when apprehended. Manhunt currently underway for white hat guy in Watertown near Boston. “…………. where the NYT clearly shows them to be of middle eastern / SW Asian origin.” You might like to read this article about one of those pictured in the NYT article. “…………….. the poor quality one which the bBC have chosen appears to show two Caucasian white males ……………”. The photographs used are those most recently released by the FBI. Are you suggesting that the FBI photographs should be ignored? Hospital confirming blast trauma, thermal and shrapnel injuries, to the whole of the man’s trunk, as well as gunshot wounds. “black hat guy” confirmed expired at the Beth Israel hospital. How long before some nut job claims that they didn’t try to save his life ‘cos they is Jooooooooose’? Somehow those don’t sound like a pair of good ‘ol boys ! National security and law enforcement officials said they were leaning toward the theory that the bombings were motivated by Islamist extremism.